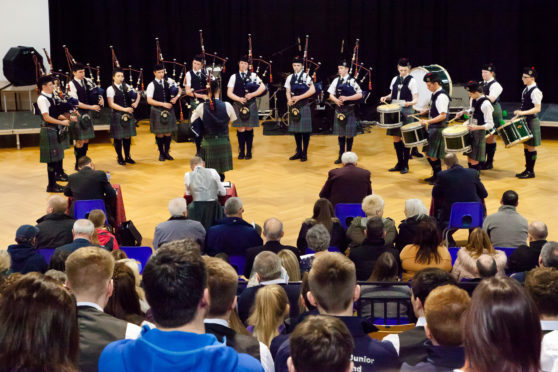 It is already the biggest schools piping cometition in the world – and this year’s is set to be even bigger, according to organisers. Organisers of next year’s Scottish Schools Pipe Band Championships say they expect more than 150 schools from across Scotland to be represented. Event organiser Patrick Gascoigne said the predicted boost is based on the number of pupils being taught in programmes run by parent charity the Scottish Schools Pipes and Drums Trust. The trust recently set up the biggest free bagpipe loan scheme in the world. He said: “The work of the Trust has been growing very fast and we now have projects going in 18 council areas supporting lessons to over 2,500 young people. Last year there were more than 70 performances during the day and First Minister Nicola Sturgeon presented prizes to the winning bands. Alexandra Duncan, trust chief executive, said: “SSPDT aims to safeguard our wonderful musical traditions and to help young people develop skills for life, learning and work, with a focus on deprived and remote areas, by helping to introduce piping and drumming tuition to state schools on a par with orchestral instruments. The championships are held in Inveralmond Community High School in Livingston and entries can be made through the website. The popularity of the event is a major success for the organisers, who only four years ago were campaigning for more tuition in state schools. At that time they feared Scotland’s national instrument was in danger of extinction. The contest received the backing of Craig Munro, of the hugely successful Red Hot Chilli Pipers.